I have finally managed to build the preamp from the old German radio parts, but this being my first audio project I also succeeded to mess thing up. Before buying the components for 'the real thing' I made the prototype from what I had. This means, I used the 2x190V+7V transformer from the radio resulting in 400V DC B+. Therefore I changed the cathode resistor to 510ohm to bias it at 1.6V. I also used a 500k taper from the radio. The problem now is that even with the taper on maximum, the volume in the headphones is really really low. So I started digging for an answer and the only thing I can think of is that the preamp has an output impedance too high for headphones. So I was thinking of adding an output transformer. But before I buy anything, I wanted to check with you guys if any of this makes sense. As I already said, I'm a noob here. Use a resistor or two to drop the the B+ voltage down to the listed amount and use correct cathode resistor. I am not sure if you would get anything out of headphones, if it was working correctly. The original design for this preamp uses capacitive coupling to drive into high impedance loads around 250K ohms. Not sure you could use a OPT without a re-design. 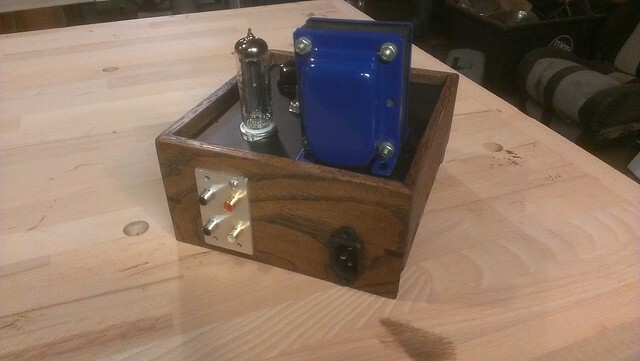 This is a voltage amplifier, not a power amp. 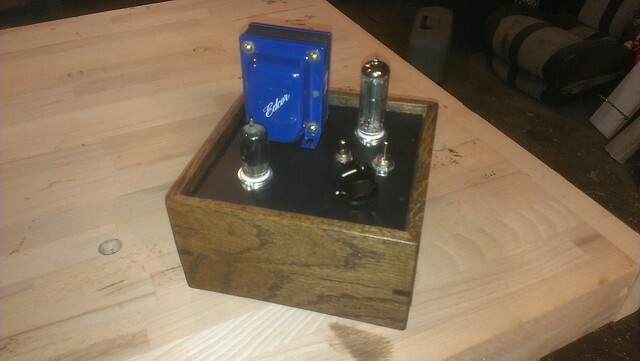 If you want to drive headphones you should use a12ax7 in this design and then run it into a 12AU7 cathode follower. This will provide the low imnpedance output and voltage swing you need to drive headphone. Although the 6AS7 might make a better driverrif your HPs are low impedance. Look at Mark's recent project for setails. I understand. Thank you all! Would there be any problem with adding a selector switch to add two or three more inputs? I always build mine with at least two selectable inputs and lately three selectable inputs. I got most of my 4S ready for the wiring; I'm just waiting for the polyurethane to dry a bit more. It's also my first time putting splines into the corners of the oak sides. The splines are some thin cedar boards that I had laying around. I was going to put a second set up a bit higher but I realized I didn't have a good way to clean out between the two saw kerfs. One question... where's the fuse?